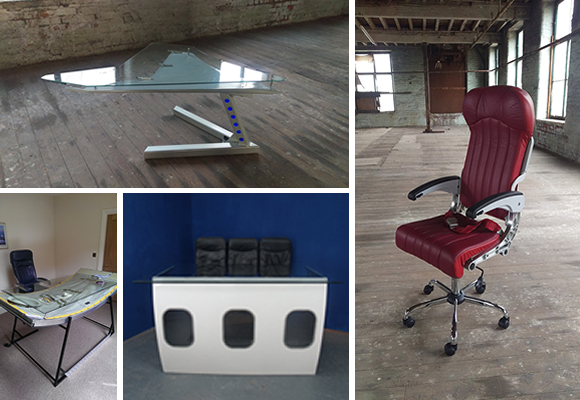 Stu-Art Aviation Furniture was created by Stuart Abbott and is based in North East England. 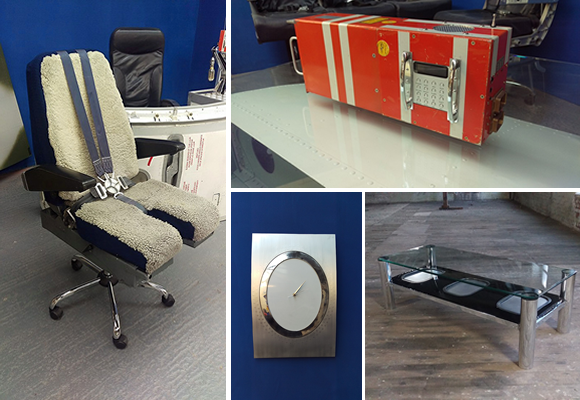 This wonderful furniture company designs and manufactures “World leading aviation inspired furniture for homes, office and commercial use” using recycled parts of different types of aircraft. The bespoke furniture selection, named as the “Mile High Range”, is inspired by Abbott’s passion for deconstructing, recycling and redesigning parts of aircraft and creating high end furniture pieces for clients. The range consists of clocks that are made from plane windows, executive and reception desks that are created around plane fuselages and coffee tables from jet engines. He has even created office chairs making use of plane seats… with the seat belt included! Just make sure that you don’t remove your seatbelt until the pilot switches the warning light off! The materials that are used are parts of structures that would otherwise be regarded as scrap. Recycling what anyone else would see as “trash”, Abbott cleverly and skilfully uses his talents to convert these components into a stylish, practical piece of furniture. Some, like myself, may even say that the furniture is a work of art like the aircraft itself was previously! Stu-Art seems to keep the marvel of aircraft design alive. I was very excited when I heard about this fantastic company! Being a big fan of aircraft and a furniture enthusiast, having the two combined is like a dream come true for me. I will certainly be asking my MD if we need a glass coffee table made from a Boeing engine in our lobby? If not, I am sure I could sway him towards having a reception desk designed around a plane’s Emergency Exit!